When we think of summer BBQ's, most think of hamburgers and hot dogs or ribs lathered in thick tasty sauces. Picnic tables filled with pasta and potato salads, baked beans, and all the other yummy things that make your mouth just water thinking about it. How can you keep that great BBQ feeling and taste throughout the summer without expanding your waistband? Here's a couple tips for your summer fun. The great thing about cooking outdoors and having BBQ's with friends and family is that you can plan it out, and keep things low calorie, healthy, as well as delicious for everyone. 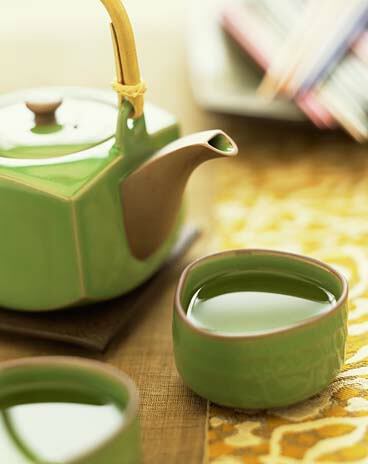 The main key is staying away from the heavy sauces, which add a boatload of calories and sugar. Most people don't think of sugar when they think of BBQ sauce, but it's a main ingredient, especially those that are ketchup based, as well as sugar packed Worcestershire sauce. You can find a great free BBQ sauce recipe by clicking here. Again, planning and preparing your own foods and sauces can be the difference of thousands of calories consumed over summer. Another great way to eat healthy is kebabs! When you create your own kebabs, not only can you choose that goes on them, they are a great food tool when it comes to portion control! Fresh meats, veggies, fish, even tofu and fruits can be added to any kebab. 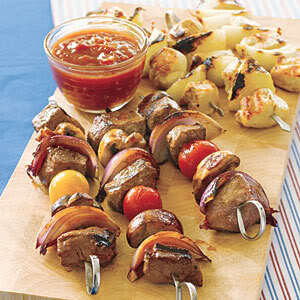 Click here for a couple great kebab ideas for your outing. There are great recipes and information out there for planning healthy summertime meals for you and your guests. For more great ideas, visit the Integrative Nutrition Blog and their 100 Recipes for a Healthy Summer. It's all in the planning! That way, if you allow yourself that "free day" to indulge, you won't have to have the helping of guilt to go along with it! I hope you and yours have a happy, healthy summer, and take time this weekend to honor and remember those that have fought and died for our nation. Ever since TLC put out their new show "Extreme Couponing", people have jumped on the bandwagon full throttle, while others have been left in awe and confusion. For myself personally, it's great that these people are serious about their couponing, but when in fact, most coupons are for foods that have a long shelf-life, and in turn, are not very high on the list of healthy foods. For household products, toiletries and pet products, it can be great! All in all though, couponing can really save you money if you invest the time. 1. Find a Couponing Class - The hubby and I found a free couponing class that one of the local women puts on every month. The local newspaper actually pays her to give the class, and in turn, she sells subscriptions to the newspaper after the class is over. Take the time to look for these types of classes. You can get them FREE!! I've seen some advertisements where people charge up to $25 for you to attend a 2 hour class. For me, isn't that just counteracting the fact you are trying to SAVE money? Do some searches for local bloggers that coupon and you might find these classes as well. 2. Find Coupons for What You Need/Like - If you are a shopper that enjoys certain things, get coupons specifically for those items. 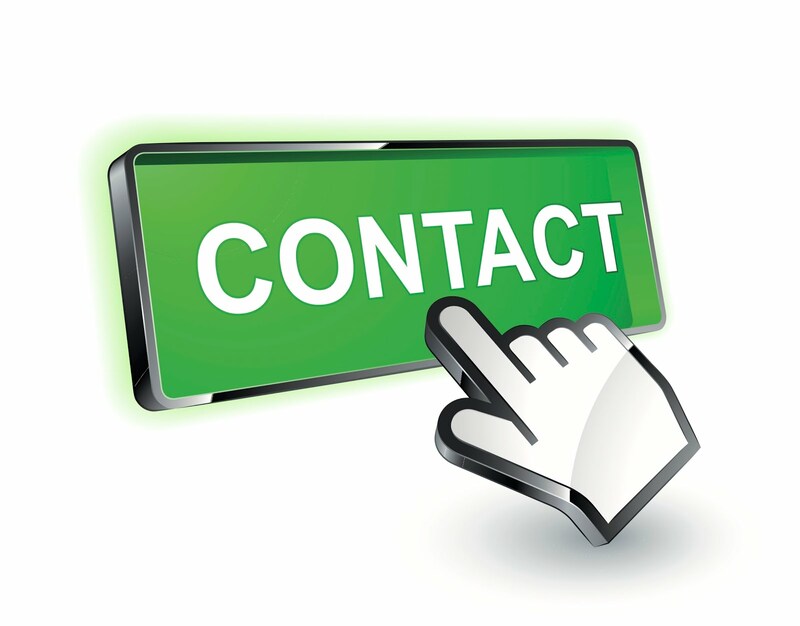 A great way to do this is through Facebook or through the product's website. For instance, we go through Coffeemate creamer like crazy. Well, their website constantly has coupons for their product. Also, if the product has their own Facebook page, you can look down their left column list on their page and look for special offers. It's quick and easy, and you don't have to wait for the paper or an online couponing site to have what you like. 3. Be Patient - If you do clip coupons on Sundays, don't feel the need to use those coupons THAT weeks shopping trip. Sales usually have a 12 week cycle, so unless the coupon is going to expire that week, wait a little, and you might see a buy one, get one free sale on the product, or there might be a double or triple coupon sale coming up. You can get the most out of your coupons this way. 4. Use the Internet - There is a mountain of couponing information online. Not just for online coupons, but there are even bloggers like Coupon Divas or CouponMom.com that not only have links to coupons, they have posts and databases that will show you exactly what items at what stores are the best deals, and even how to get items for FREE! You don't have to be a mathematician to coupon, these types of websites do it all for you and freely give the information! 5. Food Co-ops - Look for food co-ops in your area that might have food deals. One program out here is called Bountiful Baskets. You can get a great mix of fruits and veggies for half of what it costs at the grocery store. Click here to see what I got in my basket one time for only $15! Couponing can be fun and it definitely is a rush when you are at the register and watch your planning and couponing strategies lower that total due, but unless you want stock piles of items that take up your basement, garage, spare bedroom, or stuff crap under your kids beds, you CAN adjust couponing to meet your own family's needs. I know for me and my little family, even getting over $100 worth of meat for $60, or a couple months worth of toiletries for $20 is worth it. It may not be "extreme", but for our needs, it's still having us a lot of money each month, and those savings add up. 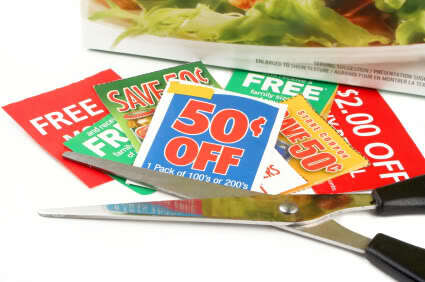 And to end this little couponing journey... remember that you don't need to throw away those unused and expired coupons. You can support your troops overseas by donating them!! The commissaries and BX's on bases abroad will take coupons up to 2 months past the expiration dates. You can visit the Overseas Coupon Program and adopt a base, and start mailing your coupons once a month to them! It's like sending cash overseas!! Have a great day and happy couponing!!! DO YOU WANT TO BE ABLE TO MAINTAIN THAT WEIGHT LOSS? You wanted it, so here it is!! The weight loss breakthrough we've all been waiting for! You can't find this information anywhere but right here, right now!! I'm about to reveal TWO very important secrets that will not only help you LOSE weight... but KEEP it OFF!! Seriously folks. Since when are people going to wake up and realize that there is no quick fix to weight loss. There is no pill, no surgery that will help you lose weight, and KEEP it off, unless you learn a proper diet and exercise regimen that turns into a LIFESTYLE for you. I'm so sick of seeing magazine covers claiming so-in-so-celeb reveals their secrets to weight loss, or for keeping their amazing bodies. Sure there's a plethora of food choices out there, and there's weights, yoga, pilates, dance, etc... but in the end, it's basic DIET AND EXERCISE. I've seen ladies talk about how they are taking some droplet before meals, and eat only 500 calories a day! Are you serious?? Most nutritionists and doctors will tell you anything under 1200 a day is considered starvation, unless you are under 5 ft! What type of nutrients and fuel do you think your body is getting with only 500 calories? Then there's surgery. For a quick fix, yeah, sure you can lose weight, but it's because you simply CANNOT eat what a normal person would. Once your stomach is back to normal, then what? What have you learned about proper nutrition? Have you learned that in order to keep that weight off you will need to eat a balanced diet and exercise, or are you going to take all that money either you, the insurance company or the taxpayers paid for you to get the surgery, only to blow right back up? Or are you going to spend the rest of your life on that starvation diet, because I'm sorry, once you go back to eating "normal" will gain the weight as fast as it came off! It's a lifestyle change. You don't need to tackle it all at once. Small changes over time will help you get into your grove for LIFE. Not just that Monday you decide to start your "diet" up. Maybe start one week by consciously drinking more water. Maybe sign up for one or two exercise classes at the local Y. Small steps can lead to large rewards. This isn't just about getting to a healthy weight, it's also about maintaining that weight for the rest of your life. Everyone's different, so different things are going to work for different people. What you enjoy may not be what someone else enjoys in regards to food or how they workout. In the end, however, what they all have in common is that they started paying attention more to what they put into their bodies, and started moving more! What changes will YOU make? How will/did you start your journey to a healthy lifestyle? Life can get crazy, and now that Dylan's been home a month, it has seemed like the entire month has been filled up with doctor's appointments between he and I. He went -for his 2 month immunizations, and I went for my postpartum check up. 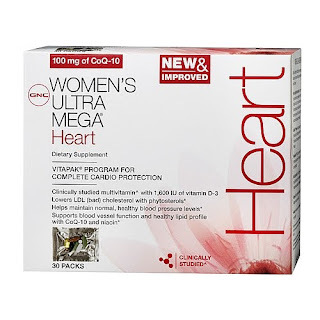 I also went to a cardiologist appointment, because when I had ketoacidosis and gastroenteritis complications in January and was hospitalized, they did an abdomen ultrasound, but in doing so, they found I had minimal plaque build-up in my arteries. So now at the age of 37 (38 in August) I have coronary artery (heart) disease. It's common in diabetics. Having diabetes has aged my body about 15-20 years. It's a slow killer, and after years of it going untreated, because of no insurance and no money for insulin, it has taken it's toll and rearing it's ugly side effects all over the place. My cardiologist put me on a baby aspirin regimen, and of course as always, to keep my blood sugars under control through diet, exercise and insulin. 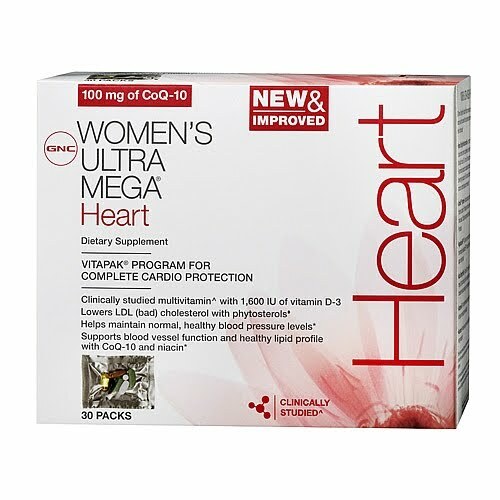 To make sure that I'm getting all the extras I need, including more omega-3 fatty acids, CoQ-10, iron, niacin, vitamins & minerals that support a healthy heart on a whole, I've supplemented my diet with GNC Women's Ultra Mega® Heart Vitapak® Program. Even though it may say it's for women over 50, keep in mind what I said about diabetes aging my body. I have to attack these issues head on and keep moving forward, helping my body out the best I know how. Some people think these packs are too expensive, but with the Gold Card price and my military discount, it averages out to less than $1 a day. If I can't spend $1 a day to help keep myself in the best possible health, then I have more problems than just my health. Our diet at home has changed a lot, as the hubby and I are adding more fruits and vegetables into our diets. Sure, we still have the occasional lazy mean, like a beef/noodle concoction, but we've started eating smaller portions and adding a salad, or a side of fruit. Getting off the junk food and easy prep meals can be hard, but it's still a transition in progress. I'm starting to exercise when I can, and I know it will get easier, the more self-calming the baby gets. I've looked into some Zumba classes, as doing in my living room is getting a bit boring for me. I like the interaction and energy in a group setting. I can still do the basics at home, and our complex has a small gym with weights, treadmill and elliptical if I want to go that route. With the warmer weather, there is the Green Belt here in Boise that is a great trail to walk or run on. I love that this town has so many positives that promote a healthy lifestyle. Can't wait for the Whole Foods to finally open here! Never been near one before! Another added bonus. I just have to "keep on, keeping on" and do this for myself, my family and be an inspiration for others. I need to get into great shape so that I can go for my personal trainer license and get certified to teach certain exercise classes. I can't wait for things to start coming together. These are my goals, and with school starting back up for me on June 8th, that's another goal that will be reached in time. My bachelors in nutrition science!! I've already been accepted into the National Society of Collegiate Scholars and I'm also a member of KUMSA. They are just extra boosts and motivation as I tackle my college courses. Well, that's the latest. I have been trying to make it around to my friend's blogs and I have actually caught up, and so glad I did! There is such a plethora of information out there. You just have to go out there, grab it and absorb it!! Have a great weekend, and Happy Mother's Day tomorrow to all that mother and mentor this world! Cheers! !